South Park Hill, which is south of Park Hill and Northeast Park Hill, shares the same east/west boundaries (Quebec and Colorado) with its northern neighbors, but its southern boundary is Colfax and its northern is E 23rd Ave. This end of Park Hill weighs in with big homes, quaint cottages, and boulevards of Denver’s historic founders’ homes. Park Hill was the mastermind of the quirky and bizarre Baron von Winckler, who fled Prussia in embarrassment and died with a flourish. In between, he built Park Hill, taunted his neighbors, failed at the races, and ultimately scorned everyone. He was, none the less, able to persuade the rich to locate their homes east of City Park and away from the filth of downtown. They purchased the homes along Montview Blvd for $5000, and Park Hill began. All of Park Hill’s history is fabulous. You can read about more of it in my Park Hill/Northeast Park Hill walk, or buy yourself a gift and get The Park Hill Neighborhood book by Noel and Hansen. The neighborhood can get heady on the important corners and along the parkway corridors. But intermingled between the big homes are charming bungalows and artful alleys. Holding up the eastern end of neighborhood sit the old Colorado Women’s College, now schooling artists at The Denver School of the Arts, and culinarists at Johnson & Wales University. Like its northern neighbors, the South Park Hill homes range from large historic mansions from the turn of the century to 1940s-50s homes surviving the World War II boom. There are few scraps and flips here; the neighborhood seems to want to hold on to its history and charm. Sadly, no parks dot South Park Hill, but both 17th Ave and Monaco hold nice grassy park-like medians. Large trees have matured, providing park like conditions even where no parks exist. 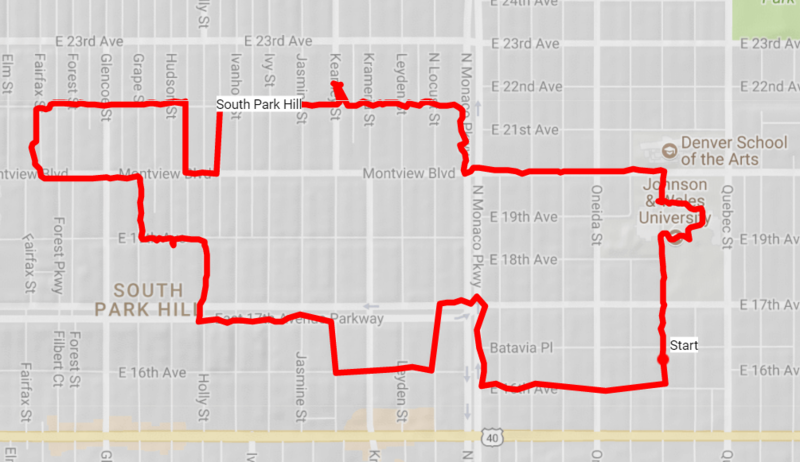 On this 4-mile walk, we followed the recommendations of Historic Denver and authors Thomas Noel and William Hansen from their book The Park Hill Neighborhood, following a route that stopped at many of the homes mentioned in the book. Start at 1642 Pontiac St. Head south to 16th Ave. Take a right. Take a right on Monaco Parkway, then take a left at the intersection of E 17th Ave Parkway. Head west to Locust St, take a left. At E 16th Ave, take a right. At Kearney St, take a right. Take a left on 17th, stopping at the corner of Holly. Check out the house at 1660 Holly. The largest house in Park Hill encompassing 13 lots, the Marsh Mansion was built by the vice-president of the Western Sugar Company. Eventually it became the headquarters of the Bethlehem Fathers, a Catholic Foreign Ministry Society. Currently, it’s a private home. Cross 17th and stop at the NE corner of Holly. At 5609 17th Ave Parkway, you’ll find the Walsen House. Restored with individually numbered roof tiles, the Walsen family of the American Bank and Trust, enjoyed their custom perennial gardens and garage with a custom car wash.
Continue north on Holly to the quaint cottage at 1735 Holley Street. 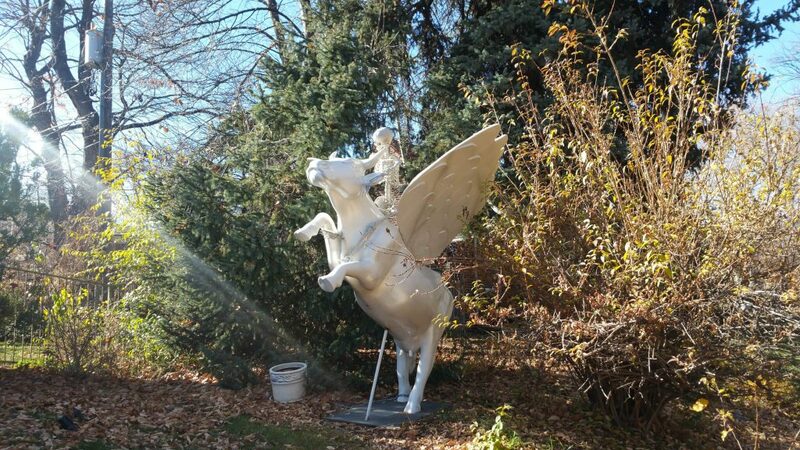 Home to the Idris/Melrose family of artists and one of the first female advice column writers for the Rocky Mountain News, this darling cottage keeps its charm with cairns and dragons in the yard. Continue on 17th to Hudson. Stop at 1790 Hudson, the Bondy House. Heavily remodeled shortly after being built, the owners of this home made their fortunes in the auto and the cigar businesses. 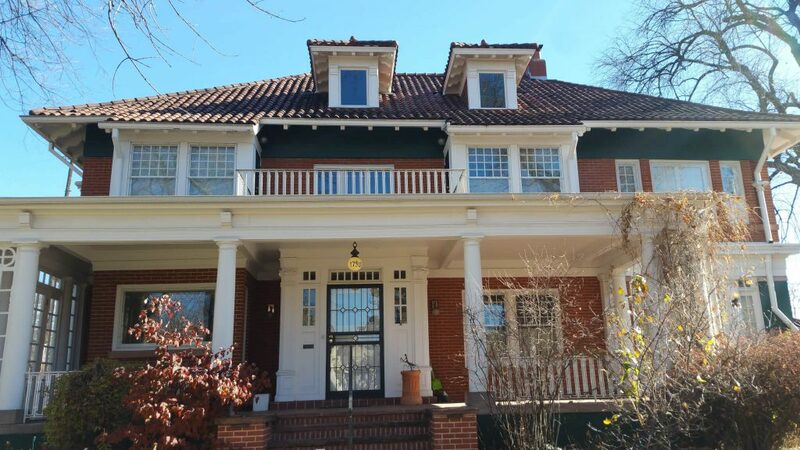 In 1999, the current owners restored the home by the founder of the Rocky Mountain Map Society, who has helped Denver Public Library improve its map collection. Take a left on 17th and then a right on Grape. On Montview, take a left, stopping at 5209 Montview, the Park Hill United Methodist Church. Notice the well-done expansion on the east side, the towers and ornate entries. Continue west, stopping at the Beeler/Hall House at 5101 Montview Blvd. 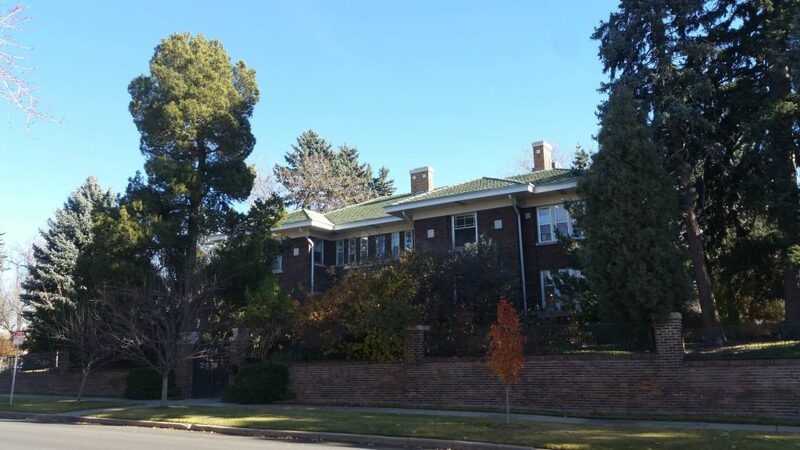 Owned originally by John Beeler who was vice president and general manager of Denver Tramway who ended his career ultimately in New York, working on its subway system, the home’s landscaping was later improved by the Halls. The Halls added gaslights, a perennial garden and other features designed by city planner Saco DeBoers. Take a right on Forest, then a right on 22nd. Continue on 22nd to the alley between Hudson and Holly. 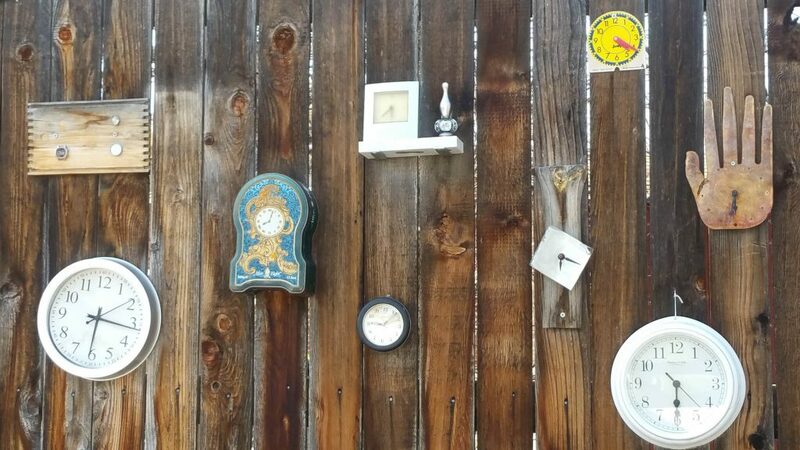 Go south through the alley, enjoying the eclectic collection of art and artwork displayed by the alley residents. At Montview, take a left, then at Holly, take a left, continuing north. On 22nd, continue to the right to Kearney. Take a break at the darling Cake Crumbs, winner of the Today’s Show’s best oatmeal cookie in the US. Make sure to buy this delicious treat. After enjoying your treat, continue along 22nd. Take a right on Monaco, crossing it at Montview. Walk along Montview a few blocks until you get to the Denver School of the Arts. A Denver Public School magnet school, it attracts high-performing students who can major in one of eleven arts, including the performing arts. The campus was the northern buildings of the Colorado Women’s College, which crossed Montview. Founded in 1909 to rival Vassar, the Women’s College was eventually absorbed by the University of Denver. 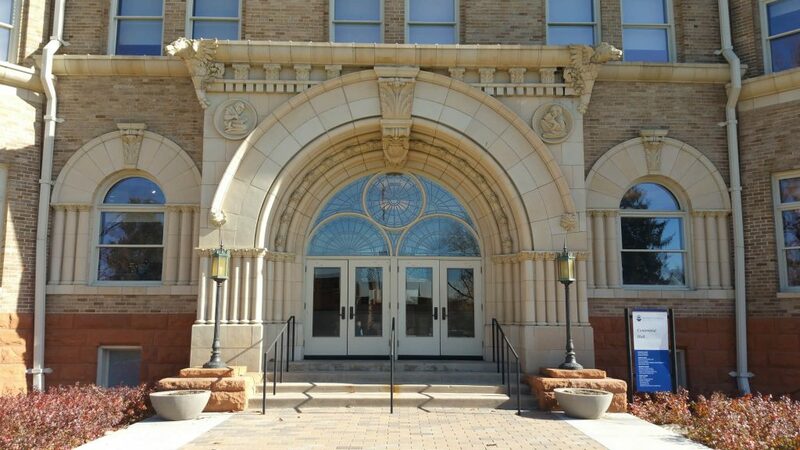 It is now the The Women’s College of the University of Denver. Cross the street and enter Johnson & Wales University. The Denver campus, one of 4, opened in 2000. JWU has the largest culinary arts program in the US and also graduates students from its Business, Hospitality and Arts & Sciences Colleges. On the campus, veer to the left, taking the sidewalk past the historic buildings, working your way around a semi-circle toward the southern edge of the campus. After enjoying the campus, exit its southern edge onto Pontiac and return back to where you started. Did you enjoy this walk? What was the best part?